I am not an absolute Ivesian. Some of his works seem to me complete successes, such as the Three Places in New England, the Holidays Symphony and some of the shorter orchestral pieces, but I have not yet been won over by the numbered symphonies. He has seemed to me too in love with the hymns, marches and popular songs of his boyhood – though I must admit Mahler had analogous tastes – and seemed to me very variable in the success with which he combined them with his own dissonant idiom into convincingly coherent works. Add to this the rebarbative persona he cultivated, his apparent indifference to completing his works or having them performed and his aggressive dismissal of most other music, and you have a musical personality you can take or leave, and which I have tended to leave as much as take. However, I thought I should re-examine my prejudices and this disc provides a suitable opportunity. It begins with the Orchestral Set No. 2 (the No. 1 is the Three Places in New England) and this is certainly one of Ives’s successes. The three movements are all quite short. The first, ‘An Elegy to our Forefathers’ mixes phrases from the nineteenth century composer Stephen Foster in a slow moving and atmospheric fantasy. The second, ‘The Rockstrewn Hills join in the People’s Outdoor Meeting’ reworks various ragtime dances Ives wrote for a theatre orchestra and features an elaborate piano solo part, here nicely played by Bavouzet, who is well known for his performances of impressionistic music. The third movement, ‘From Hanover Square North, at the End of a Tragic Day, the Voice of the People Again Arose’ evokes the occasion when news of the sinking of the Lusitania by a U boat in 1915 reached New York and incorporates a short, quiet choral passage from the Te Deum. This piece features Ives’s characteristically conflicting keys and rhythms. Here it works well. Andrew Davis uses a version of the score edited by James B. Sinclair who has also recorded the work (review) which I think must have helped clarify the textures. Symphony No. 3 was based on organ pieces Ives wrote during the few years he worked as a church organist. The first movement, ‘Old Folks Gatherin’’ begins slowly before moving to a kind of dance which leads through a development to a quiet end. The second movement, ‘Children’s Day’, is fast and cheerful. The third is spiritual, with more of the complexity of the mature Ives. It ends with distant bell sounds. Andrew Davis has a fine grasp of the work, bringing out its symphonic nature and securing a lively performance from the smaller forces required. Symphony No. 4 is a notorious monster, not for its length, which is modest, nor even for the forces required, which are not vastly more than normal apart from the use of three pianos, one tuned in quarter tones, and the optional use of an ‘ether organ’, more of which in a moment. No, the challenge is in the extreme complexity of parts of it, particularly the second movement. It begins with a powerful short Prelude which features a chorus. The second movement, the longest is titled ‘Comedy’ and is loosely based on a short story by Hawthorne, ‘The Celestial Railroad’ which is a parodistic sequel to Bunyan’s Pilgrim’s Progress. The protagonist leaves the City of Destruction by train for a fast route to heaven. Of course it doesn’t quite work out like that and from time to time we hear more orthodox pilgrims making their way on foot. When I first heard this movement years ago it seemed to me simply a mess. Davis, supported by Chandos’s engineers and an assistant conductor, has done wonders in clarifying the textures and holding the piece together. This is followed by a gentle Fugue and a Finale which uses the melody of the hymn ‘Nearer, my God, to Thee’ which is eventually sung – but without words – by the chorus. Ives was, in the end, a religious composer. I am full of admiration for how Davis has realised this work, which has certainly made me rethink my attitude towards the composer. Perhaps the last movement does not quite achieve the transcendental effect which seems intended, but I am not sure whether this is the responsibility of Ives or of Davis. I am very glad he doesn’t play it for sensation but makes it a moving and indeed a coherent work. Again the edition of the score is specified, and this is a recent one edited by Thomas D. Brodhead. The problem with the ‘ether organ’ is that no one seems to know quite what instrument Ives intended. It used to be thought it was the early electronic instrument the theremin, and I have heard the symphony performed with one, but apparently this is not right. Ives also asked for it in the Orchestral Set No. 2 as well but I have to say that I did not have any sense of a missing line in either work. I have already praised the work of the Chandos engineers. The booklet has detailed notes on the works and an additional piece by Davis, mostly about the fourth symphony. There are French and German versions as well. The Melbourne Symphony Orchestra and, where required, their Chorus, have been well prepared and provide secure performances with a good deal of imagination and fantasy. I do have two niggles. The disc label and the booklet notes both suggest that the programme ends with the Orchestral Set No. 2 rather than beginning with it. The listing at the front of the booklet is, however, correct. And Chandos continue to confuse their customers by titling the disc on the spine ‘Vol. 3’ rather than simply stating what the programme is. In multi-volume series – not all of which you might have or want – the volume number is of little interest but the contents of the disc certainly are. They should adopt Hyperion’s practice on this. The main competition to these recordings seems to come from Michael Tilson Thomas some years ago and Andrew Litton more recently, but their couplings are different and I think they do not use the latest versions of the scores. 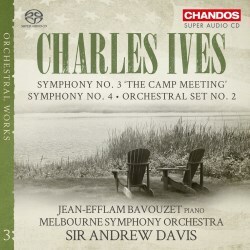 If you think it is time to come to terms with Ives this is a good disc with which to do it.